Dell EMC, the market leader in the Data Protection Appliance & Software Market, is introducing significant improvements to the performance, cloud expandability and flexibility to the Data Domain portfolio of physical and virtual appliances. Specifically, the release of Data Domain Operating System (DD OS) 6.2 delivers faster instant restore and recall from the cloud, an expanded public cloud ecosystem, along with more efficient capacity management for long-term retention in the cloud from physical Data Domain appliances, and more public cloud options for in-cloud data protection with Data Domain Virtual Edition. In addition, Data Domain DD3300 (the DD appliances targeted at mid-size organizations and ROBO environments) now comes with more capacity options, faster networking capabilities, and support for more backup targets. Dell EMC Cloud Tier: Expanded public cloud options for long-term retention to the cloud – now available on Google Cloud Platform and Alibaba Cloud. In-cloud data protection with Data Domain Virtual Edition (DD VE): Expand support for software-defined, in-cloud data protection to additional public cloud environments – now available on Google Cloud Platform, AWS GovCloud and Azure Government cloud computing. DD VE can also now scale up to 96TB per instance – on-premises and in the cloud. Easier management of multi-cloud environments: Data Domain Management Center (DD MC) now provides singe UI management for all Data Domain appliances – on premises and in the cloud. Instant Access / Restore Enhancements: Up to 4x increase in IOPS – I.e. up to 40,000 IOPS with 20ms latency. Improved RTO with faster file restores: up to 2.5x faster file restores from a Data Domain appliance and up to 4x faster recall from the cloud. Expanded Data Domain Boost File Systems (Boost FS) coverage: Now supports Windows environments in additionto Linux. More Capacity Options: DD3300 portfolio has been extended with a new 8TB model that can scale up to 32TB. Faster Networking and More Backup Options: DD3300 delivers faster networking with support for both 10GbE and expanded backup options with support for Virtual Tape Libraries (VTL) over Fiber Channel. Dell EMC Cloud Tier now provides customers with even more choices to extend their data protection to the Cloud for long term retention to Google Cloud Platform, Alibaba Cloud, AWS Infrequent Access, Azure Cool Blob storage and Azure Government Cloud. With this expansion, Cloud Tier now supports: AWS, Microsoft Azure, Virtustream, Dell EMC Elastic Cloud Storage, ceph, IBM Cloud Open Storage, Google Cloud Platform, Alibaba Cloud, AWS Infrequent Access, Azure Cool Blob storage and Azure Government Cloud. New Free Space Estimator capability for Cloud Tier provides the ability to estimate on-premise and cloud storage capacities before a workload is moved to the cloud. This capability improves management of data movement to the cloud for long-term retention purposes, thus, helping lower costs for long-term retention to the cloud. Cloud Tier is now more efficient and cost effective because it requires less reads from and writes to the cloud (due to larger object size). Data Domain Virtual Edition (DD VE), which provides software-defined data protection on-premises and in the Cloud has expanded its public cloud support and in-cloud capacity. DD VE can now support up to 96TB per instance in most public cloud environments by supporting backup to object storage in these environments. Specifically, DD VE can scale up to 96TB in AWS S3, AWS GovCloud, Azure Hot Blob and Azure Government Cloud. In addition, DD VE can support up to 16TB in Google Cloud Platform. 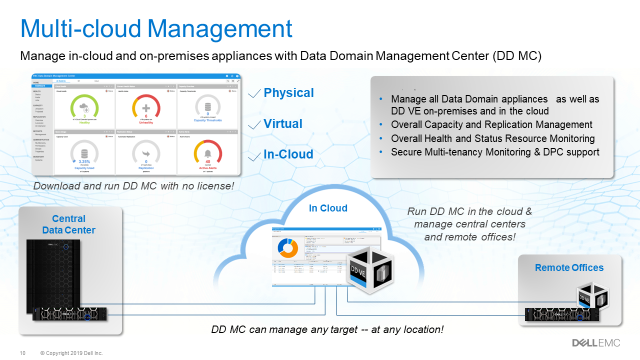 Data Domain Management Center (DD MC), simplifies monitoring and managing of multiple Data Domain and DD VE appliances – on-premise and/or in the cloud – from a single UI. It is a license-free capability that customers can use with their Data Domain deployments. Instant Access / Restore capability enables organizatins to run up to 32 VMs live on their Data Domain appliances. This enables customers to utilize their Data Domain appliances to get more value from their backed up data – for Test/Dev as well as running their workloads live from their backup appliances instead of waiting for the workloads to be restored to their production environment. We have greatly improved application performance under Instant Access /Restore with enhanced data cache that results in significantly higher IO performance. The result is up to a 4x increase in IOPS – up to 40,000 IOPS with 20ms latency. Data Domain now also delivers even faster file restores (improving RTOs) from both on-premises appliances and from the Cloud – up to 2.5x faster restores from the appliance and up to 4x faster recall from the Cloud. In addition, the new Data Domain Boost File Systems (DD Boost FS) plug-ins for Windows enable faster application direct backups and client side deduplication for Windows environments – now customers can take advantage of Boost FS in Windows as well as Linux. In 2018, Dell EMC introduced the Data Domain DD3300, a small 2U form factor appliance that was designed for smaller, mid-size organizations and remote and branch offices of larger enterprises, delivering enterprise level, cloud-enabled data protection at a lower cost to protect. DD3300 now offers more options and flexibility for our customers with a new capacity option (an 8TB model that can scale up to 32TB), faster networking capabilities with support for 10GbE, and expanded backup options with support for Virtual Tape Libraries (VTL) over Fiber Channel. To learn more about the Dell EMC Data Domain, check out the Dell EMC Data Domain home page, read Data Protection blogs, and follow @DellEMCProtect on Twitter for our latest announcements and content.